The state of Odisha extends from Latitude 17° 31’ to 20° 31’ N and Longitude from 81° 31’ to 87° 30’ E. It is surrounded by West Bengal North East, Bihar in North, Andhra Pradesh on the South East, Madhya Pradesh in the West and Bay of Bengal in the East. The total area is 155707 sq. km., which is divided into two natural divisions: The Coastal Plain & North Western Plateau. The state is divided into 30 districts. Mahanadi is a very large river crosses through the state and its big delta merges into the deltas formed by the Brahmani and the Baitarani. The deltas are fertile and are provided with irrigation facilities. Earlier the State was divided into 13 districts. Later it was further divided into 30 districts. The total population as per 2011 census is 4,19,47,358. The state is divided into 58 sub-divisions, 317 Tahsils, 314 Blocks and 6227 GPs. There are 51349 villages in Odisha and 107 Urban Local Bodies. The number of Assembly Constituencies are 147 where as that of Loksabha Constituencies is 21 & Rajya Sabha seat is 10. 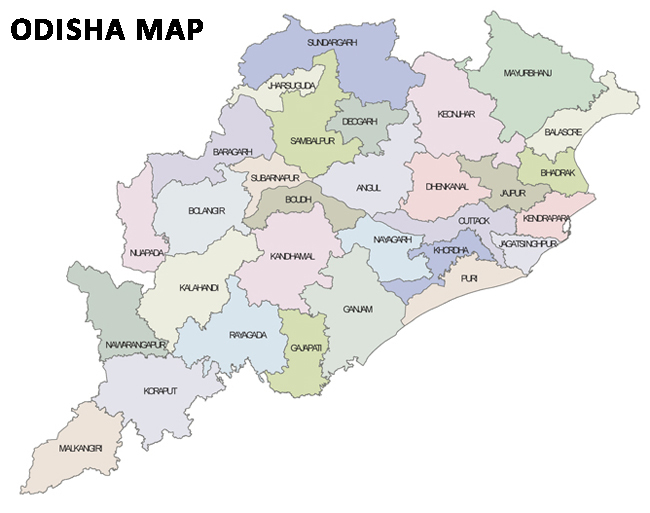 There are four Municipal Corporation working in Odisha, namely Bhubaneswar Municipal Corporation, Cuttack Municipal Corporation, Berhampur Municipal Corporation and Rourkela Municipal Corporation.